At the start of 2017, it feels that many of the world’s greatest challenges are being left unsolved and unaddressed by leaders in government and business. In the last year especially, we have been confronted with an array of grim numbers and escalating events: millions of refugees with nowhere to go; unexpected decisions on Brexit and in the US elections; melting ice caps; growing income and wealth inequality; terrorist atrocities; and the fake news phenomenon implicated in the rejection of globalization and the rise of nationalist and populist politics. I have picked just three significant issues that illustrate the challenges we face as we meet again in Davos. First, just over a year after the monumental Paris agreements, a cloud of uncertainty now looms over the enforcement of the climate change framework to curb carbon emissions and limit warming. Some incoming and existing governments have vowed to not uphold it – potentially imperiling the planet with irreversible environmental consequences. Second, the future of work paints a dark picture for the global middle class. Widespread estimates indicate that by 2020 a net total of 5.1 million white collar jobs will be lost to automation . While it is understandable that recent populist movements have targeted globalization and trade , evidence points to robotics and artificial intelligence (AI) as far greater threats to employment. The gig economy is already straining worker protections built on a different model of employer/employee relationships, which included linking health and pension schemes to full-time employment. AI and robotics are likely to take job displacement to a different level, potentially increasing income inequality. Third and finally, the World Economic Forum significantly downgraded its projection for reaching global gender equality to the year 2186 - an unconscionable 170 years away. The evidence shows that the social, economic and financial opportunity-costs of not advancing women are enormous. In 2014, this same forecast estimated that parity would not happen until 2095. While also unacceptable, this initial estimate still seemed within reach to some. It seems conditions have worsened in just two years and equality is now completely out of reach. Together these and many other issues are simultaneously racing towards breaking point, further adding to the increasing tension and fear we are now seeing in many of our communities. Despite years of debate and mounting evidence on these issues – the perception is that collectively we inexplicably paid little real attention and hence made little to no improvements. There is also a sense that the right issues are not being addressed or only make it into the public and political discourse once it is too late. For much of the last century, we expected our leaders to see the future, explain the challenges and navigate us through the contradictions, dilemmas and, of course, the dangers. Most of all, we expected them to work on our behalf to think carefully, critically and strategically to take us safely through the obstacles ahead. Around the world we are now seeing a high level of disillusionment. People have lost confidence in governments and big business and are longing for strong leadership. But are the recent moves to greater nationalism, populism and rhetoric, rather than evidence-based debate, really what we need? 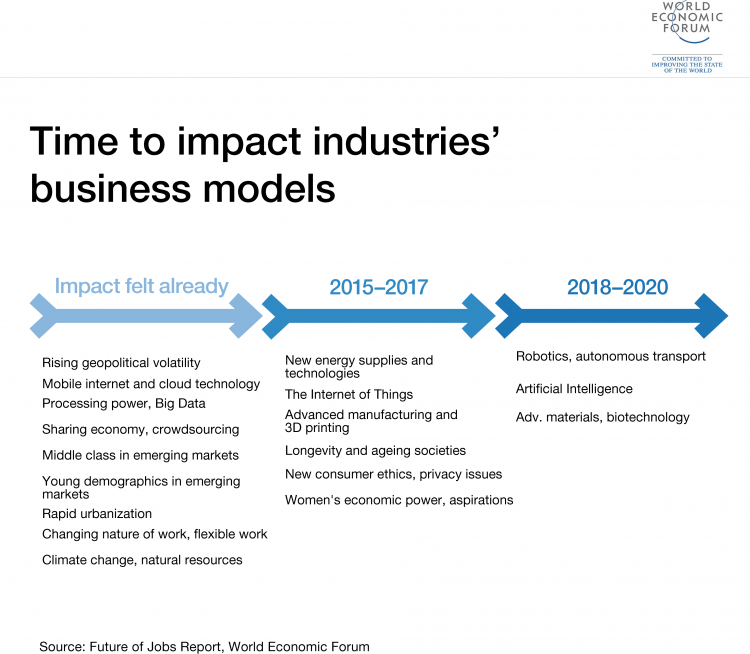 We now live in a world in transition – from the model of society we know to one that is much more unknown as a result of the Fourth Industrial Revolution . It is in this context that we need to change the way we think about our long-term social interests. As we deal with the impacts of disruption from technology, globalization and changing demographics, some policy-makers and business leaders are increasingly recognizing the need for a new social compact. Our existing framework has come under more and more strain as the world is changing. Here is what I mean by a social compact: it is the implicit or explicit agreement that individuals reach to live together in civil society and covers various aspects such as the rule of law, taxation/transfer payments, national security etc. Importantly, social compacts are designed to create stability by balancing the needs of individuals versus institutions, and the collective good. To develop and progress we need a leadership style that demonstrates courage in the face of divergent views and places emphasis on fact-based decision-making – not gut feelings or unsubstantiated opinion-based dialogues. It also requires leaders who can create real change without alienating diverse stakeholders. In response to the current conditions, a new social compact and standard for leadership must emerge to meet a new set of needs in the 21st century. What is required is leadership able to work together to decisively solve the issues hindering long-term prosperity on this planet. With the rise of technology, greater transparency is easier than before – we just have to use it for good. Importantly, leadership requires us to challenge ourselves when the facts do not fit into our own world view. Facts should inform and shape opinion, not the other way around. Last year’s meeting in Davos generated a common understanding of the challenges we face as a result of the Fourth Industrial Revolution. As we consider new models for leadership in 2017, we must now focus on action. Time has not yet run out, but we need to come to Davos with a greater sense of urgency.